Please be advised that The Counselling Foundation of Canada is fully granted for 2018 and 2019. The Foundation is undergoing a strategic planning process and will not be considering new grant proposals until September 2019. The Foundation can make grants only for charitable purposes and only to organizations which have been issued a registered charity number by the Canada Revenue Agency or to Guaranteed Donees under the Income Tax Act of Canada. We typically provide support to test new or innovative initiatives that address challenges either in a manner that has never been done before (i.e., a new idea), builds upon existing approaches in an original way (i.e., a new method), or deals with chronically under-served populations. Reviewing our latest Activity Report is a good way to learn about the types of projects we support and is an excellent way to determine if your proposed project fits within the general scope of our interests. The Counselling Foundation of Canada uses an online portal to process funding requests. Our grant process beings with a submitting a short Letter of Intent (LOI). If Foundation staff sees alignment between your project and the Foundation’s goals, you may be invited to submit a formal Grant Application. Please see the Granting Process diagram at the bottom of this page as it outlines the typical granting timeline and the funding process milestones. The Board of Directors typically reviews Grant Applications quarterly in February/March, May, September, and December. Only the Board approves funding requests. All granting decisions are final and there is no appeal process for requests that have been declined. Notification of Board funding decisions, both positive and negative, are usually provided within 48 hours of the Board meeting. Once a grant applicant has been notified that the Foundation’s Board of Directors has awarded them funding, a Foundation representative will be in touch to finalize the details of the grant. These details include the payment schedule, reporting expectations & timetables, and knowledge dissemination benchmarks that align with the grant recipient organization’s timing and project milestones. This information will be documented in a Grant Letter of Agreement signed by representatives from both the grant recipient organization and the Foundation. This process is typically completed within 30 days of notification of a successful grant application. If you have any questions about our granting process, please contact Ben Liadsky (Program Officer) at 416-923-8953 (extension 121) or at ben[at]counselling.net. 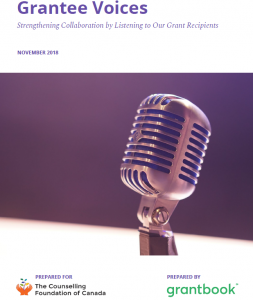 In 2018, The Counselling Foundation of Canada in collaboration with the Lawson Foundation, and the Laidlaw Foundation undertook a project to gather feedback from our grant recipients. GrantBook was hired to collect and synthesize the confidential feedback about grant recipients’ experiences of working with us. Today, as part of our efforts to be transparent and to encourage ongoing openness to talk about how we can continually improve, we are happy to share with you the final report. Grant recipients are indispensable partners in achieving our mission. Open dialogue and honest feedback are central to effective partnership, and while we strive to be responsive and open, we also know that it isn’t always easy to tell a funder that there is room for improvement. This survey represents a first step in our journey to better understand how we can support our grant recipients. Over the coming months, we will be taking further actions to learn more and make tweaks to how we operate. As we go, we’ll keep you in the loop.